Designing physical security for any facility requires layers of security measures to protect buildings, property, assets, and people against intrusion. These measures must include protecting the outer perimeter, the inner perimeter, and the building’s interior. In some structures, such as buildings that have adopted the open office concept, meeting these security needs has some unique challenges. In an open office, everyone works in one large room. While this does allow for easier communication and collaboration, there are no walls or locked doors to impede any intruders. 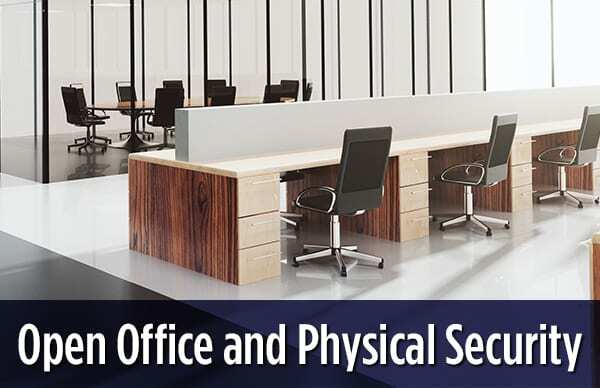 The open office concept requires different security considerations from the traditional style individual office concept. In open office planning, an entire open area must be treated in its entirety, with a strong outer perimeter. Examples of security challenges in open concept buildings are not difficult to find. Recently, on June 28, 2018, five people were killed in a shooting at the Capital Gazette newsroom in Annapolis, Maryland. The gunman walked into the building and barricaded the rear exit of the newsroom before he began shooting. The newsroom’s design was open-concept, a popular design choice for news organizations, meant to make it easier for the community to provide news tips. From a physical security perspective, open-concept buildings present a unique set of serious challenges. Their design makes it difficult to seek protective cover and provide an unobscured sightline to an active shooter. The lack of defined spaces also makes it impossible to lockdown any specific areas. This makes perimeter control of heightened importance. Open concept offices are popular all over the US with nearly 70% of American employees working in an open office environment, so understanding the security needs of these spaces is mission critical. Here are some important tips to improve security in the open office environment. Implement a gunshot detection alarm system. Cover windows with a protective film that obscures the direct line of sight. If you have questions about security for open concept security, please contact us today!